Museums throughout the world are under increasing pressure in the wake of the 2008/2009 economic recession and the many pressing social and environmental issues that are assuming priority. The major focus of concern in the global museum community is the sustainability of museums in light of these pressures, not to mention falling attendance and the challenges of the digital world. Museums and the Paradox of Change provides a detailed account of how a major Canadian museum suffered a 40 percent loss in its operating budget and went on to become the most financially self-sufficient of the ten largest museums in Canada. This book is the most detailed case study of its kind and is indispensable for students and practitioners alike. It is also the most incisive published account of organizational change within a museum, in part because it is honest, open and reflexive. 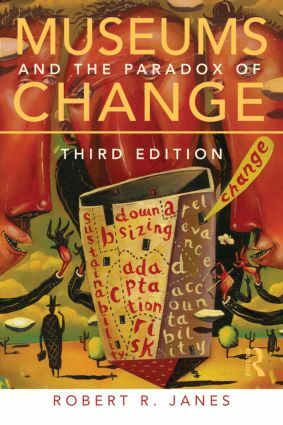 Janes is the first to bring perspectives drawn from complexity science into the discussion of organizational change in museums and he introduces the key concepts of complexity, uncertainty, nonlinearity, emergence, chaos and paradox. This revised and expanded third edition also includes new writing on strengthening museum management, as well as reflections on new opportunities and hazards for museums. It concludes with six ethical responsibilities for museum leaders and managers to consider. Janes provides pragmatic solutions grounded in a theoretical context, and highlights important issues in the management of museums that cannot be ignored. “Janes’ richly textured, incisive and extraordinarily candid analysis of organisational change provides readers with a highly original, valuable and compelling suite of insights for contemporary museum thinking and practice”. – Richard Sandell, University of Leicester, UK. “Janes’ book, in the third edition, offers incalculable fresh contributions to our understanding the constant, necessary dynamic tension between social and financial capital in society’s cultural spaces. He is a first ranked thinker, here drawing others of his ilk into a 21st Century dialogue of change management. Every museum, library, archive, and theater leader and every consultant to these fields should have a dog-eared copy of this book.” – Mary Case, Museums Consultant, USA. “A very inspiring work that details the organizational change of Glenbow Museum. Not only has it unveiled the social relationships between the different positions inside museum space, but also, through reflective and critical thinking, it has illuminated the value of the museum in contemporary world. By arguing the value and purpose of the museum, Robert Janes creatively harnesses the power of management to vitalize museums and civil society. This book is an honest voice and impassioned manifesto, which is indispensable for all the museums that are seeking to map their future.” – Hsu Huang, Editor-in-Chief, Museology Quarterly; Associate Curator, National Museum of Natural Science, Taiwan. Robert R. Janes is the Editor-in-Chief of Museum Management and Curatorship, a Visiting Research Fellow at the School of Museum Studies at the University of Leicester (UK), an Adjunct Professor of Archaeology at the University of Calgary, Canada, and the former President and CEO of the Glenbow Museum (1989–2000). His museum books include Museums and the Paradox of Change (1995; 1997), Looking Reality in the Eye: Museums and Social Responsibility (with Gerald T. Conaty – 2005), Museum Management and Marketing (with Richard Sandell – 2007), and Museums in a Troubled World (2009). Janes has worked in and around museums for 36 years as a director, consultant, author, editor, archaeologist, board member, teacher and volunteer. He continues to champion museums as important social institutions – capable of making a difference in the lives of individuals and their global communities.